Hurray! I have not only finished my 5-man Tactical Squad, but I have also built and painted their lovely car Dedicated Transport - a Razorback! This one has been kitted out with a twin-linked Lascannon for a bit of extra 'oomph'. I have tried to use the correct markings where possible, showing company designation and vehicle numbering. I opted for blue for the lenses on the Lascannon turret as a contrasting spot colour. I think it stands out quite well. Whilst the basis for the Chapter iconography is the traditional black winged blood drop, I have added a little splash of colour to the drop itself to tie it in with the detailing on the Marines. For a bit of added flexibility, I built the Razorback so that it could be retro-fitted to turn it into a Rhino. Whilst a Razorback is currently ideal, my ultimate aim is to build (if not run) ten-man squads, so they need some bigger wheels. Here they all are, showing off their new ride. This here blog is a collection of my hobby projects, many of which stretch back for years. I am simply collecting them here in one place for posterity, and to allow friends, family and anybody who may be vaguely interested to have a look through them. I would be the first to admit that this is an insanely nerdy blog... But I'm a nerdy kinda guy, so if the boot fits... 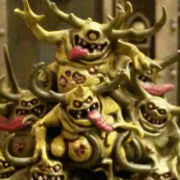 Please feel free to leave comments (positive or negative), or to get in touch with me if you are interested in any aspect of Warhammer 40,000, Warhammer Fantasy Battle, or any kind of miniature gaming. It's always fun to be involved with the community. For my most recent painting projects, check out my Tumblr feed!